Susan Blaakman has been a member of the psychiatric nursing faculty at the University of Rochester School of Nursing since 1999. She has taught and advised students at the baccalaureate, master's, and doctoral level, and has been specialty director of the family psychiatric mental health nurse practitioner program since completing her doctorate in health practice research in 2011. She is a nationally certified psychiatric mental health nurse practitioner and has acquired vast clinical expertise in psychiatric assessment and diagnosis, crisis intervention, tobacco dependence intervention, high-risk youth behaviors, research with vulnerable populations, motivational interviewing, and health behavior change across the lifespan. Blaakman has co-authored many publications and was honored with the 2013 Rochester Academy of Medicine Nursing Award for her clinical research. 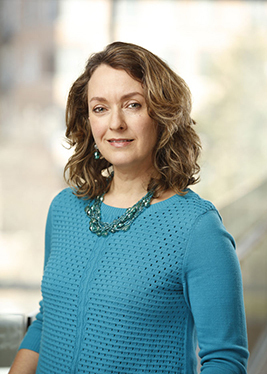 She also serves as a project nurse, motivational interviewing interventionist, and co-investigator in general pediatrics at the University of Rochester Medical Center. A active associate of the American Psychiatric Nurses Association, she is a founding member of the ANPA Motivational Interviewing Task Force, and was formerly co-chair of the ANPA Tobacco Dependence Council. She earned a bachelor's degree from the Honors College at SUNY Oswego and bachelor's, master's, and doctoral degrees from the UR School of Nursing. Blaakman, S.B., Tremblay, P.J., Halterman, J.S., Fagnano, M., & Borrelli, B. (2013). Implementation of a community-based secondhand smoke reduction intervention for caregivers of urban children with asthma: Process evaluation, successes and challenges.. Health Education Research, 28, 141-152. Halterman, J.S., Riekert, K., Bayer, A., Fagnano, M., Tremblay, P., Blaakman, S., & Borrelli, B. (2011). A pilot study to enhance preventive asthma care among urban adolescents with asthma.. of Asthma, 48 (5), 523-530. Halterman, J.S., Borrelli, B., Conn, K.M., Tremblay, P., & Blaakman, S. (2010). Motivation to quit smoking among parents of urban children with asthma.. Patient Education and Counseling, 79, 152-155. Sharp, D.L. & Blaakman, S.W. (2010). The significance of tobacco dependence in persons with mental illness. In N. Monson (Ed. ), Treating Tobacco Dependence in Persons with Mental Illness: Breaking Barriers and Implementing Changes.. American Psychiatric Nurses Association Counseling Points..
Sharp, D.L., & Blaakman, S. W. (2009). A review of research by nurses regarding tobacco dependence and mental health. In L. Sarna & S. Bialous (Eds.). Annual Review of Nursing Research, 27, 297-318. Sharp, D. L., Blaakman, S.W., Cole, R. E., & Evinger, J. (2009). Report from a national tobacco dependence survey of psychiatric nurses. Journal of the American Psychiatric Nurses Association, 15, 172-181. Sharp, D., Bellush, N., Evinger, J., Blaakman, S., & Williams, G. (2009). Intensive tobacco dependence intervention with persons challenged by mental illness: Manual for nurses. American Psychiatric Nurses Association Tobacco Dependence Resource Center. Sharp, D. L., Cole, R. E., Kourofsky, C. E., & Blaakman, S. W. (2009). Intervening with youth who engage in fire-setting. In K. Geldard (Ed.). Practical Interventions for Young People at Risk, 102-112. Sharp, D. L., & Blaakman, S. W. (2009). Report from the APNA Tobacco Dependence Council. Journal of the American Psychiatric Nurses Association, 15, 412-414. Sharp, D. L., Blaakman, S.W., Cole, R. E., & Cole, E. C. (2006). Evidence-based multidisciplinary strategies for working with children who set fires. Journal of the American Psychiatric Nursing Association, 11, 329-337. Cole, R., Crandall, R., Kourofsky, C. E., Sharp, D., Blaakman, S.W., & Cole, E. (2006). Juvenile Firesetting: A Community Guide to Prevention and Intervention. .